​Roof collapses happen annually each year resulting in substantial property damage - sometimes causing critical injuries. While roofs can collapse for many reasons, such as poor construction or design, they tend to happen most frequently during the winter months when snow and ice accumulations are at their highest. Southern Alberta winters can bring extremely heavy snow loads and chinooks create an ongoing thaw/freeze cycle throughout the winter. This combination can lead to drain blockages and substantial ice/snow accumulations that can exceed the structural weight load for many roofs. Snow removal and adequate roof maintenance needs to be a priority in Southern Alberta. Although any roof can collapse under the added weight of snow and ice, flat roofs are the most prone to drain blockages and snow/ice buildup. How Much Snow Is Too Much Snow? Roofs normally have a loading range of 10 – 70 lbs per square foot depending on the design and/or construction of the roof. • 10 – 12 inches of fresh snow weighs about 5lbs/square foot. 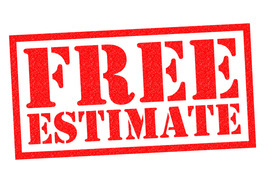 • 3 – 5 inches of packed or older snow weigh about 5lbs/square foot. • 1 inch of ice and/or water weighs about 5 lbs/square foot. The formation of “ice dams” usually happens after a snow fall and a period of below freezing temperatures. When warm air inside the building begins to warm the underside of the roof, usually due to inadequate insulation, eventually reaches the cold overhang of the roof. Because the overhang is usually the same temperature as the outdoor temperature – the melted water starts to freeze again and causing icicles and ice dams. These ice dams can block your gutters and prevent proper roof drainage. When this happens, water can make its way into the building’s structure and possibly cause damage to insulation, mould, mildew and begin to rot the roof deck – further limiting the roof’s snow load capacity. 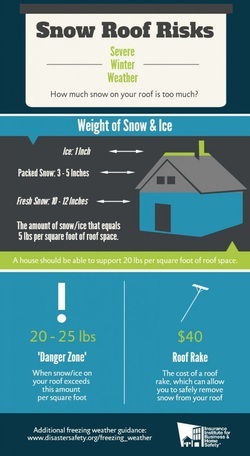 The weight of snow and ice may not always be evenly distributed on the roof. Proximity of nearby buildings, additions, changes in elevation, vents, and roof equipment may cause increased amounts of snow and ice to collect with strong winds or storms. Any changes or additions to a roof that were not factored into the original design and construction may affect loading capacity and need to be taken into account.